Dixie is just over 1 yr old and was an owner surrender. She is medium size and has good house manners especially for her age. She has a lovely natural tail. She is being fostered with 2 male dogs, horses, an inside cat and a barn cat. If you are interested in adopting Dixie, please complete the Southwest Airedale Terrier Rescue online application form. FAITH – Arizona – ADOPTED! Faith is an 8 year old spayed female being fostered in Tucson, Arizona . She is up to date on vaccinations and negative for heartworm, tick fever and valley fever. She has always been well cared for. She is used to staying home alone with a working family, using her dog door to freely move between house and yard and going for walks through the neighborhood every day. She grew up with children from age 5 through the late teens. She rides quietly in the car and walks on leash without pulling or making any fuss. She is affectionate, but calm and not a real cuddler other than a few minutes in the morning and whenever you come home. Faith LOVES playing with other dogs – she plays rough and likes to body slam and sounds as though she is ready to tear the other dog’s throat out, but she is all play and other dogs know this. She had surgery on 10/8/2014 to have a wart taken off her eyelid that was irritating her eye and an epulis from her gum. She now has a clean bill of health and is ready for her new home. We are looking for someone with a dog door to a large secure yard and who will take Faith on daily walks and either have another large playful dog, or make sure she gets regular play dates and/or visits to the dog park. Please complete the Southwest Airedale Terrier Rescue online application form if you are interested in adopting Faith. If you have already filed an application, contact us to let us know you are interested in Faith of Arizona. Note that priority will be given to applicants located in Arizona. Macy is a 3 year old, 80 lb. (should weigh about 65#) spayed female. She is up to date on all vaccinations and microchipped. Macy has been dearly loved by her owner, who has owned her since she was given to her as a puppy. 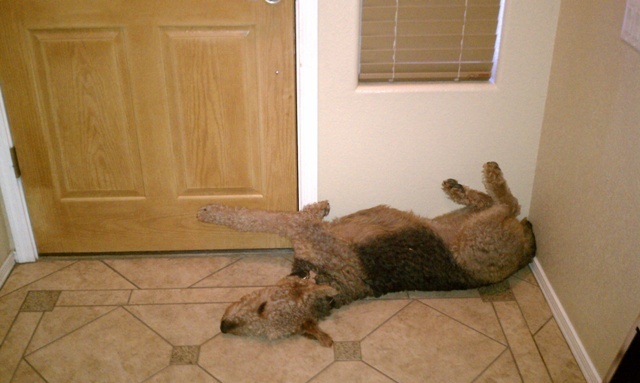 Unfortunately, Macy’s owner is now in college and cannot keep a large Airedale in her dorm room. 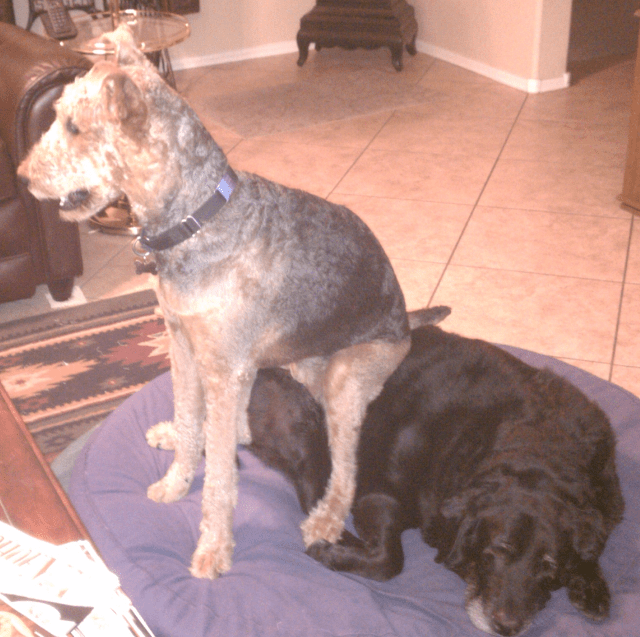 Relatives tried to give Macy a temporary home, but the terrier who lived in the home and Macy did not get along. Macy is always happy, has had a lot of obedience training and will be a pleasure to anyone lucky enough to give her a home. Macy is in Phoenix, Arizona. If you are interested in adopting Macy, please complete the Southwest Airedale Terrier Rescue online application form. If you have already submitted an application, contact us to let us know you are interested in Macy of Arizona. We do not ship our dogs. Jack is a very handsome, boisterous 6 year old boy. Jack’s former owner was not able to take him when moving out of state. Jack is very affectionate, He has a typical Airedale attention span and seems much younger than his six years! He will benefit from some obedience training, Jack does not know how to interact with other dogs and will probably be best as an only dog until he learns some manners. Jack would be great for a very active mature family. At 70 lbs., he is a big boy and could easily knock over youngsters. We want to place Jack either in Phoenix or Tucson where we have trainers who can help make sure Jack’s new home is successful. 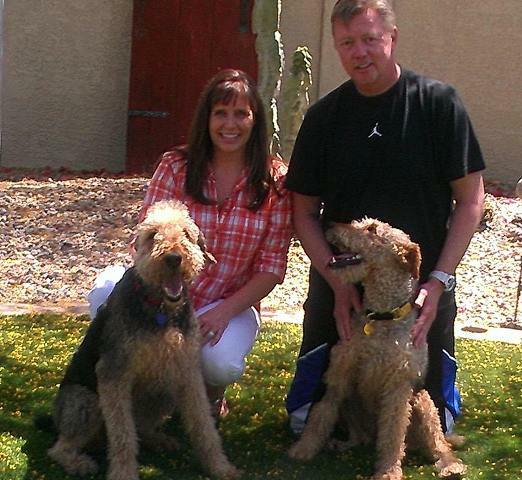 If you are interested in adopting Jack, please complete the Southwest Airedale Terrier Rescue online application form. If you have already submitted an application, contact us to let us know you are interested in Jack in Arizona. We do not ship our dogs. Callie has been well cared for and loved her entire life. Unfortunately, a change in the family’s circumstances have forced them to ask Airedale Rescue to find Callie a new loving home. 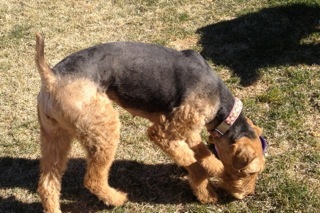 Callie is a healthy, happy, energetic 6 year old, 61 lb., spayed, Airedale girl. She is up to date on all vaccinations and microchipped. She has lived with a male Labrador retriever most of her life and her dad says she is the star of the dog park. She will play with any size dog – she bows her front down while wagging trying to get anyone to run with her. Callie has not done well with cats when she met them in the past. Callie is currently in the Phoenix, Arizona, area (Chandler). If you are interested in adopting Callie, please complete the Southwest Airedale Terrier Rescue online application form. If you have already submitted an application, contact us to let us know you are interested in Callie of Arizona. We do not ship our dogs. Marla and her new family hit it off immediately. Marla and Nash were chasing each other around the yard and Nash showed off for the new girl by jumping into the pool when we were investigating that part of the yard, which he apparently never does. He has been missing his big sister who died a while ago and is delighted to have a new girl to boss him around. They are a really nice family and I felt very comfortable about Marla joining them even though we are going to miss her a lot! They are changing her name slightly .. to Marly, only spelled Majerle;) Her family explains: we started the sports theme with jordan because she was the aire jordan then with nash so we couldn’t help going with thunder dan majerle. Personality: Kylie loves to play with the other Airedales in her foster home, and loves to steal her foster Airedale brother’s frisbee. She is very playful and happy and sweet and affectionate. She loves to cuddle in her foster mom’s lap when they watch TV in the evening. Although she is house trained, she sometimes forgets to pee outside because she is busy playing and has had a couple of accidents. This is getting better as she settles in and learns the routine. Kylie does tend to jump on people and that needs work. She is exuberant and very much a puppy still. She walks on a leash fine and is crate trained. She is in an xpen when the family is not home. She will chew on furniture and chew up paper if not watched. She is, after all, a puppy. She is a counter surfer (will steal a banana in a heartbeat. . eats them whole too!). Dogs, Cats and Kids: Kylie has always lived with another dog and will be happiest living with another playful dog about her same size. It is unknown how Kylie would react to a cat. She has been around children and loves to wash faces .. she is a kissing fool. She is very exuberant and jumps and would do best in a family with older children. Medical: Kylie is spayed, microchipped, up to date on vaccinations and tested negative for heartworm. History: Kylie was released to rescue because her very busy family did not realize how much training, exercise and attention an Airedale puppy requires. 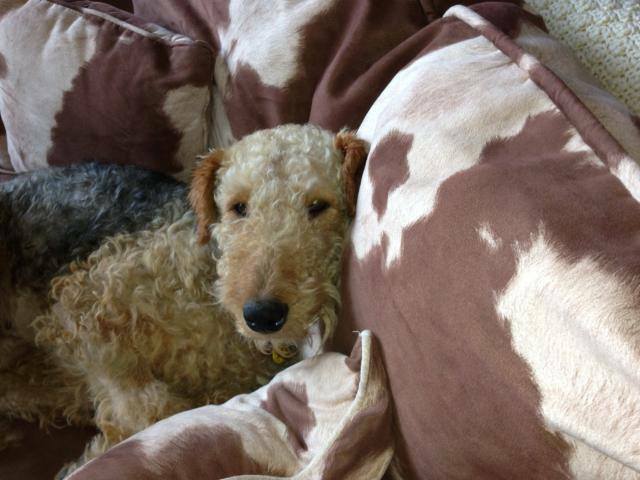 If you are interested in adopting Kylie, complete the Southwest Airedale Terrier Rescue online application form. If you have already submitted an application, contact us to let us know you are interested in Kylie of New Mexico. Kylie is being fostered near Albuquerque, New Mexico. We do not ship our dogs. 2/20/2014 UPDATE: The meeting went great and Lola is on her way to her new home! 2/20/2014 UPDATE: If all goes well, Lola has a new home. Funny little Lola would probably be a great companion for any active family that loves Airedales AND has the time and energy to exercise and train a young Airedale. She adores all people and loves to play with other dogs and a friendly, active male Airedale would be a great companion. She does insist on being first in everything — you know “What Lola Wants, Lola Gets.” Foster mom has to toss toys for her to chase so she can give her own Airedale some loving … otherwise, little Miss Lola is shoving her way right in. A dog already in the home that was jealous of the attention or had any toy or food aggression issues would not be a good match. Although she is very young (about 20 months old), she is really very good for such a youngster. As always, a basic obedience course is always a good idea with a youngster. We are looking for a family in Tucson or Phoenix that will keep her lean and give her regular exercise. A dog door would be a bonus as she loves to whip in and out at will. We don’t know where Lola started off, but her most recent owners said that they got her from a friend and she was about 20 months old (the vet thinks she might be 18 months based on her glistening white teeth). Lola was kept in the back yard during the day and crated at night. 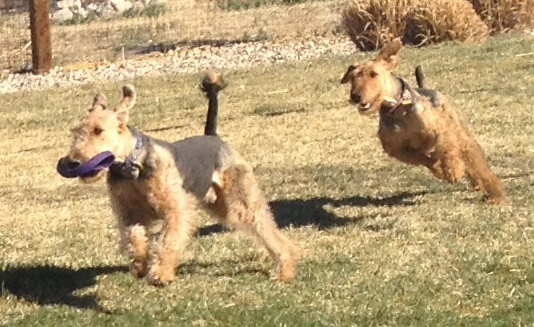 It just wasn’t enough exercise for an active young Airedale. She has obviously never been mistreated — she has no fears, adores all people and is very used to being allowed on the furniture as her right. When she first came in, she had a slight limp. Dr. Boulay, the board certified orthopedic vet who has fixed so many of our broken Airedales, took a look at her and her xrays. She does have hip dysplacia, but it is his opinion that as long as she is kept lean and well exercised, she will probably never have a problem with her hips. After a week of running around the acreage of her foster home, the limp was completely gone. In fact, she has really beautiful movement. Dr. Boulay says that the best exercise for her would be walks and short hikes, plus playing with other dogs and chasing balls and toys. Swimming would be great, but not necessary. If surgery ever did become necessary, we have set aside the funds to have that done as long as it is done by a vet of our choosing. For that reason, we want to place her either in Tucson or Phoenix. Other than that, she doesn’t really need any vet care that every other well cared for dog doesn’t get. Lola is a very pretty little thing, except for her funky flying nun ears, although we happen to think they are cute. She is adorable when she sits up like a person in the chair and watches TV! Her only bad habits are that if you aren’t doing anything and she thinks you should be playing with her, she will mouth your hands and keep offering you her paws. That is cute unless you happen to be wearing shorts! We just keep a supply of stuffed toys at hand. She loves to chase after them and then will self-amuse for a long time, tossing it around and pouncing on it. She also loves to steal dirty socks, but she doesn’t hurt them .. just carries them off and “loves” them a little. She also enjoys pre-shredding the junk mail — a “job” she loves. She loves playing with other dogs, although her first greeting is a little too enthusiastic .. she nose pokes the other dog. 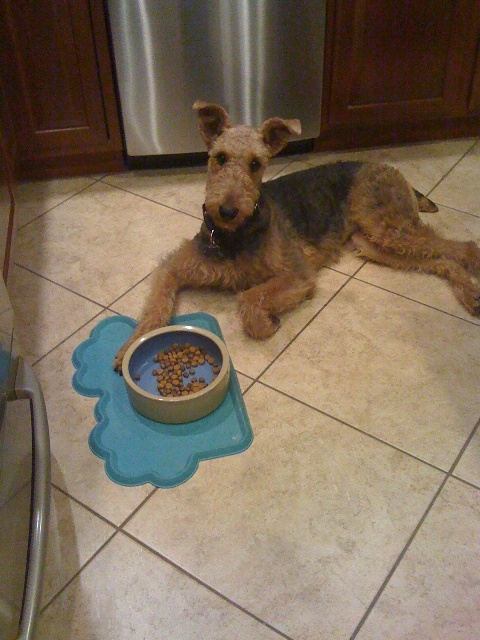 She is very responsive to correction and she gets along fine with the other Airedales in her foster home. We don’t know if Lola has been around kids. Real little kids would not be a good idea because she needs consistent enforcement of the four-on-the floor rule. But, she would love an older kid who loved to throw her toys and balls for her. If anyone is interested, let us know. The usual application and home visit process will be required before a meeting is scheduled. Meet Miss Daisy of Arizona. 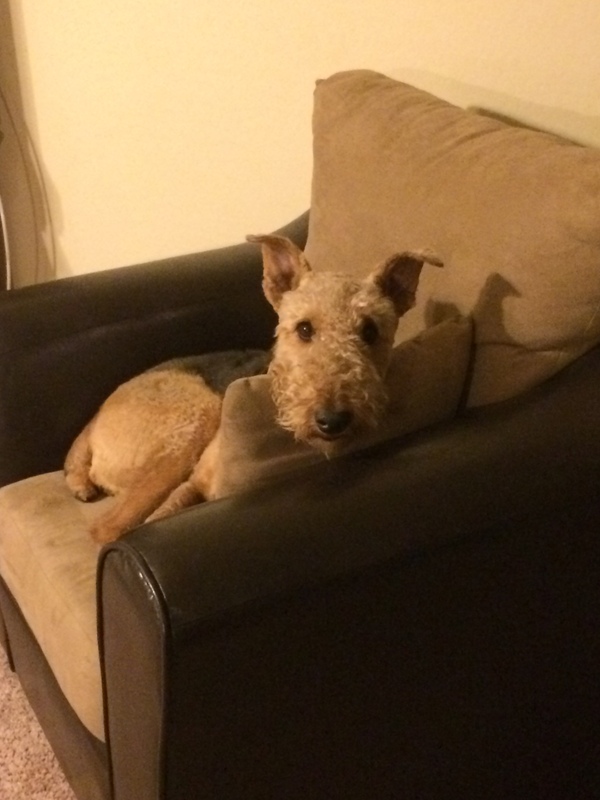 Daisy’s family reluctantly asked Southwest Airedale Terrier Rescue to place her because the husband lost his job and one of their children has serious medical issues. The family is moving in with a relative who can’t have dogs. Daisy is definitely an alpha girl, but knows her commands and listens fairly well. She’s had good training, but does need to be Queen of her castle. She is okay with most dogs after careful introductions. She is 3 years old, 70 lbs. and needs to lose about 15-20 lbs. She is very lovable, playful and affectionate. She rides well in the car. She is crate trained and playful girl. She needs a little leash work. Daisy has always been well cared for. She is in good health, all tests came back negative (heart warm, valley fever and tick fever ) and her blood work was unremarkable .. all normal. Note the natural tail! beautiful ear set! Please complete the Southwest Airedale Terrier Rescue online application form if you are interested in adopting Daisy. If you have already filed an application, contact us to let us know you are interested in Daisy of Arizona. Note that priority will be given to applicants located in the Phoenix valley.